With each and every item that you buy from us you will receive a Certificate of Authenticity which unconditionally guarantees the authenticity of your item for life. Exactly what other documentation you will receive will depend largely upon the item itself. We regularly attend Premieres, Personal Appearances, Signings and Conventions in both the United Kingdom and abroad. 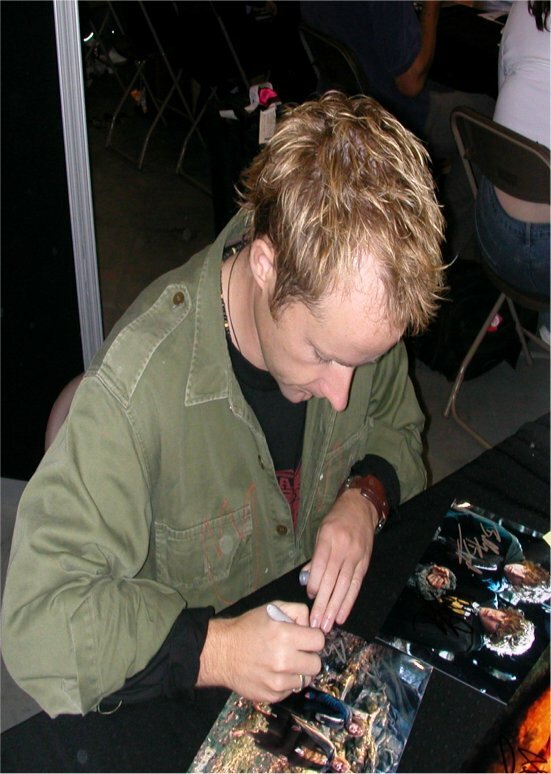 Wherever possible we will provide you with a photograph of the celebrity signing your particular item at the event where the autograph was obtained - thereby giving you complete peace of mind and confidence in the piece. These complimentary pictures are in 6x4 format. 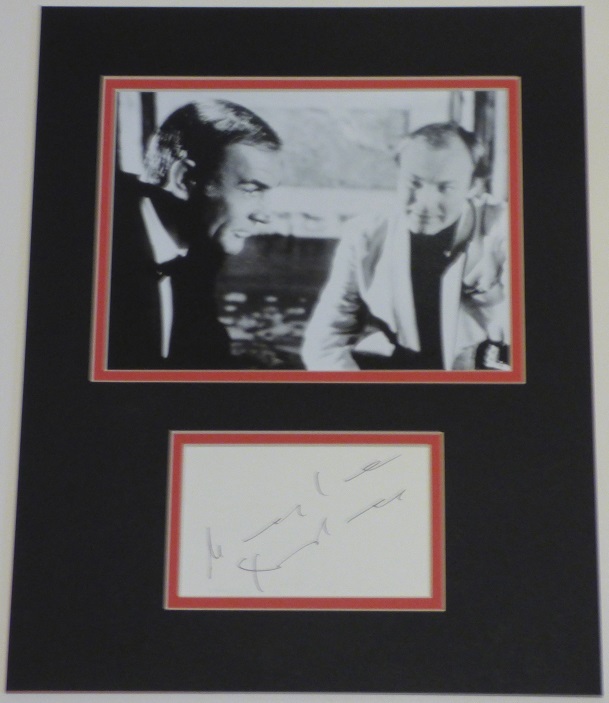 We have met a huge range of stars from the world of entertainment - we do not display these pictures on the site to prevent fraudulent sellers copying them and supplying them to unsuspecting purchasers with their fake photos. The Meeting Stars section of this site will give you an indication of just some of the many people we have met! We would stress that our American suppliers are, without exception, market leaders with impeccable reputations and track records in the autograph industry. All of our American suppliers are UACC Registered Dealers. The UACC stands for the Universal Autograph Collectors Club and is the professional body for autograph dealers. We know our material and have a huge library of resources. Having had our stock and credentials vetted by the UACC Review Committee we were UACC Registered Dealer Number 273. UACC Registered Dealers have to abide with a strict Code of Practice and undergo regular vetting of stock. We are long established businesses with faultless records. UACC Registered Dealers are without question market leaders, we are professionals who sell the best quality, authentic autographs available. Whilst our status has temporarily lapsed due to an issue with non-receipt of a renewal invoice from the UACC, we hope to be re-confirmed in the UACC Registered Dealer program within the first few months of 2008. As a rule we would warn you to be wary of Certificates of Authenticity. We feel that they can be quite dangerous in that they can give buyers a false confidence in the item they are buying. They are often produced by people who know nothing about autographs and are often not worth the paper that they are written on. A CoA is only as good as the person it comes from. As we have said above, we are UACC Members, who know our material - we therefore provide a Certificate of Authenticity that is meaningful and guarantee your item for life. For those items that we have not obtained in person, with one or two limited exceptions, they will have come from one of a handful of leading American dealers who were charter UACC Registered Dealers. We have concluded that it is also desirable for our customers to have a copy of the original Certificate of Authenticity - so you can have the reassurance of seeing their superb pedigree and you get not one, but two, meaningful certificates from market leaders with expert knowledge. We are completely open about the history of every single item that we sell, as we are so confident in their authenticity. Quite simply, we would not sell them if we were not. We will happily discuss any of our items with you. 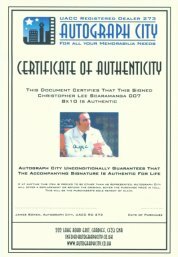 With Autograph City you get the protection of our unique double safeguard: the reassurance of a lifetime guarantee and a sight of its impeccable pedigree - be it an photographic proof of the star signing, or supporting documentation from a UACC Registered Dealer. Autograph City - for all your memorabilia needs!